A volunteer assesses hazardous materials as they are brought to one of the Pennsylvania Resources Center's drive-through chemical disposals. More than 1,500 Allegheny County residents are expected to drive to North Park next Saturday, not bearing bicycles or picnic baskets, but instead — hazardous waste. 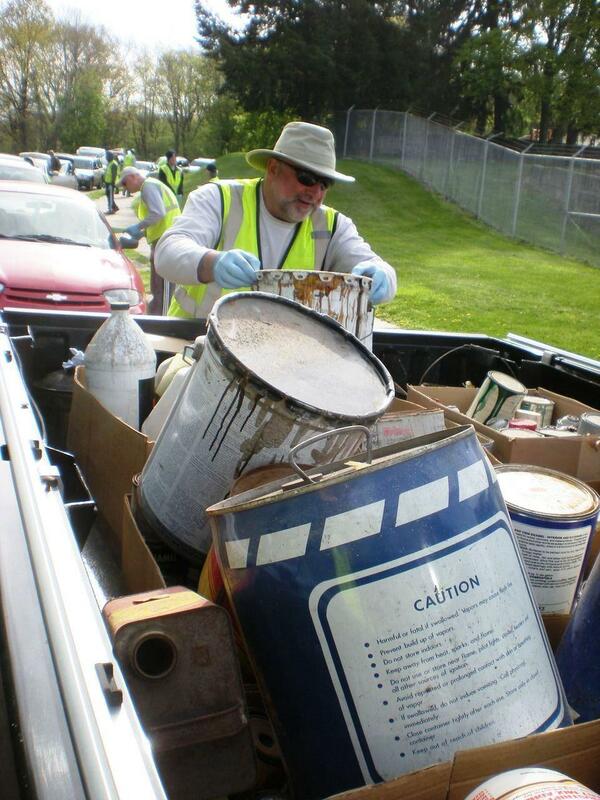 The Pennsylvania Resources Council is beginning its 13th year of household chemical collections with a drive-through waste drop off in North Park from 9 a.m. to 1 p.m. on May 2. People are encouraged to bring any leftover paint, bleach, furniture polish, gasoline, glue, cleaners, car waxes, and even fingernail polish they have in their homes or garages to the park, where trained disposal crews will haul the chemicals away for treatment and disposal. Justin Stockdale, regional director of the Pennsylvania Resources Council, said some people might be surprised by how many household goods are considered hazardous. The North Park collection will be the first of six opportunities for Western Pennsylvanians to dispose of common household chemicals, Stockdale said. There will be drop off locations in Cambria, Washington and Beaver counties, with a full schedule posted on the PRC website. The service comes with a $3 charge per gallon, with an average cost per car load of $12, Stockdale said. According to him, the actual cost of removing and treating a car load of chemicals is between $50 and $60. The cost difference is covered by state funding and local donor organizations. Those interested in dropping off chemicals must pay in cash. Stockdale said the annual chemical collections are intended to discourage people from throwing out hazardous materials with the trash, or worse — dumping them down the drain. Stockdale said the PRC is considering a permanent drop-off system for chemical waste in Allegheny County “that’s available 52 weeks a year,” but there are no concrete plans right now. The Department of Environmental Protection is moving forward with a plan to clean up the Kuhn’s landfill in Darlington Township, Beaver County. The landfill was used to dump municipal and industrial waste from 1964 until 1980 when the DEP shut it down on legal grounds. After that the DEP placed a ground cap over the site to keep various hazardous material contained. Since then other more potentially dangerous threats have kept the attention and funding of the DEP — until now. Along with pop bottles and cigarette butts, another big name is joining the roadside trash Pantheon, televisions. In January 2013 the Covered Device Recycling Act became effective across Pennsylvania. The law made it illegal for municipal trash collectors to pick up devices such as TVs, computers, and even keyboards. The purpose of the law was to rid landfills of harmful materials usually found in these devices including cadmium, beryllium, and lead. Got any medications that you don’t need any more or has expired? The Allegheny County Police want to help take them off your hands. As part of National Prescription Drug Take-Back Day, southwestern Pennsylvania residents can drop off their unused medications at the North Park and South Park County Police stations on Saturday. Walking through a grove of cherry trees, petals gently riding to the ground on a spring breeze, might sound like something out of a romance novel, but it's actually happening right now in North Park in Allegheny County. Just like the Japanese government did in Washington D.C. decades ago, a local group has given a gift of cherry trees to Pittsburgh.